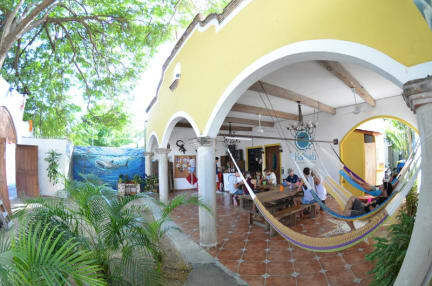 Hostel Ka'beh Cancun i Cancún, Mexiko : Boka nu! Best hostel I've stayed at by far. Going there for a third time in a week. Absolutely love it! I have been to hostels (or the like) in 37 countries and I have never felt more welcome or as much a part of the family as I did at Ka'beh. The rooms are nice and clean, there is free water, a big enough kitchen and a massive bathroom in the big dorm, but it is the amazing people who work there who make the atmosphere so inviting and chilled, which rubs off on everyone who enters, creating the most amazing, chilled vibe. With Amy, Kaitlyn, Kane, Dan and Eaves you cannot but have a great stay! Personalen var fantastisk och det var så roligt med alla aktiviteter, dag som kväll. Atmosfären var väldigt familjär och man blev snabbt kompis med både personal och övriga gäster. Enda lilla minuset är att det låg så långt från stranden. Men annars var det bäst på alla sätt! Such a great hostel! Every night is party, free beers between 7 and 8! Staff are all amazing and so helpful. Gina and Matheus both helped me extend my stay and Flor is like a nurse and bandaged me up after a small accident! Ypu have to take a bus to the beach, apart from that a good hostel and genuine staff! I'm very glad i spent some time at Ka'beh. Canćun as a city i didn't really like but the hostel was great! Fun activities every night and a really nice atmosphere. The staff was also really friendly, extra thanks to Florencia, Samantha and Brian. Such good vibe, friendly and helpful staff and great mixture of different cultures. Facilities are simple but clean, comfy beds and good breakfast.